This season we are running the first of a number of summer and pre winter training holidays for those who would like to gain more fitness, technique and general training background information for cross country skiing and biathlon. We are flexible in the arrival and departure date, that is best suited to your travel plans. This trip is open to all levels of roller skier and on snow skiers, we do recommend that you have had a good number of weeks on roller skis first and that you are able to use all the skating and classic techniques. This week is also for those looking develop key skills for biathlon, with daily shooting coaching, range drills and training. We can also arrange a number of biathlon rifles for those who require. A good level of fitness is also required, but we can talk to you more about this leading up to the week so that you can work on your fitness in the UK before deciding to book on the trip. During the we will look at a number of fitness testing methods for cross-country skiing, on and off roller skis, also strength testing. This will take place on the first day of the course so that we can tailor the remainder of the week to your needs. Each day we will be roller skiing on the roller-ski track, which is situated just on the outside of the village, and within an easy walk from the hotel. We will adjust each day to fit in with your requirements and fitness levels, with a number of fitness tests during the week so that you can take away a training plan ready for the winter season. 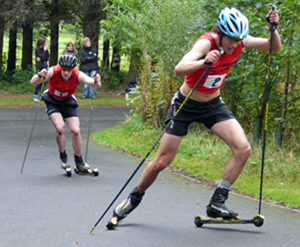 The roller ski track offers a number of loops, depending on your roller skiing level, each day we will progress your level of skiing so that you can progress to training on the full roller ski track. Along the way, the instructors and coaches will teach as if you are on snow, and develop a more solid foundation ready for the winter season. We recommend that the group book into the Fair Hotel, this is a new hotel very close to the roller ski track and the village center. The village is able to offer a wide range of other types of accommodation depending on your budget for the week, for a full list please contact the tourist office. Fly to Salzburg, then a train or bus direct to the village, with the train station within a short walk from the village and the Fair Hotel. Estimated travel time 1.5 - 2.0 hours, please look at flight options first that will match up with the train or bus times. Other airport, Munich and Innsbruck, both on the main line to Worgl then change to Hochfilzen.